Caraselle Direct – Home Accessories Products Now end of your problem use condensation absorbers. it's easy to use. Need to stop condensation forming on your windows? Our brand new moisture trap – the Gel-Safe Moisture Trap is a brilliant addition to our range of dehumidifiers and moisture absorbers. Damp is the main cause of damage to materials in the home. The Gel-Safe system regulates excess humidity, keeping it at the optimum level. This prevents damp, mould, mildew, bacteria & musty odours – improving overall air quality & comfort. 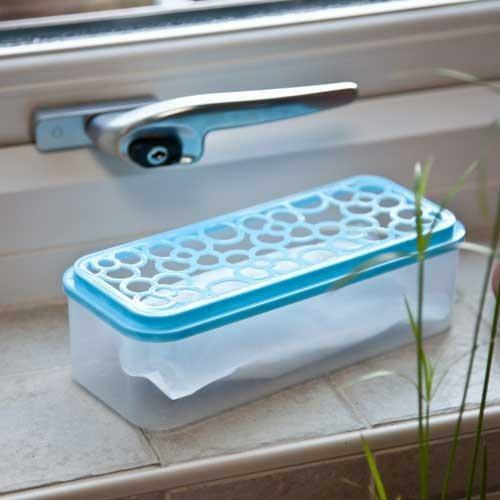 The really clever thing about this product is that the trap turns moisture into a gel, not liquid, therefore the Gel-Safe residue cannot be spilled, which makes it ideal for multi-purpose use ie. Wardrobes, cupboards, cars, caravans & boats. The refills are extremely easy to replace with no mess or spillage. There are of course additional measures you can take to finding condensation cures, including ventilating your house, especially when drying clothes or after a bath (just opening a window and closing the door is good). Plus removing condensation will also help to avoid any accompanying mold – wiping window frames regularly can help keep this at bay. However, if you have been wondering why condensation forms on your windows it’s due to excess humidity in your home. This manifests itself in the form of condensation on the coldest area of a wall, usually the windows. When the warm air (and the moister it retains) comes into contact with the colder glass in your windows it cools and releases moisture in the form of condensation. One way to reduce condensation is to control and reduce humidity and increase air flow. So increasing ventilation in your home is a must. Whenever you have a bath or shower make sure you ventilate the room. The easiest way is to open the window and close the door – many people simply open the bathroom door which means all that moisture is simply going into the rest of the house which isn’t what you want! The same applies to drying clothes. We all need to dry our clothes inside the house in Winter for obvious reasons, but ideally drying clothes in a room such as your porch or any room you can shut off from the rest of the house is a good idea. Large amounts of moisture are generated in a house from these two activities, so taking such actions does help. Kilrock Moisture Trap: Condensation Absorber! 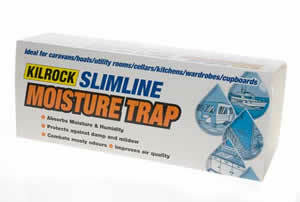 The Kilrock Slimline Moisture Trap – a high airflow moisture absorber, with excellent absorption rates. It helps to prevent damp & mildew damage to walls & fabrics by absorbing moisture & humidity. Both reusable & refillable, it works immediately. Suitable for all rooms and no electricity or batteries required! It has an easy fill top and no spill sides. With a refill indicator it’s easy to ensure you don’t forget when it needs refilling. 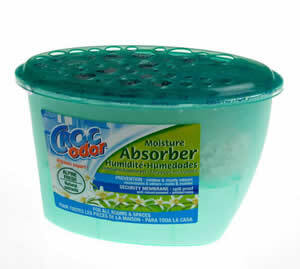 Croc Odor Moisture Absorber – great for small rooms and spaces. Being completely spill proof makes it perfect when you need to use it near pets or children. Don’t forget to keep mold at bay too by wiping any moisture that has formed on the windows with an absorbent cloth. A great range of products and following such advice means an end to the annoying problem of condensation on windows!